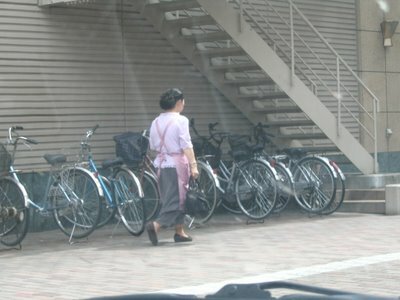 Here in Japan (or perhaps is it better to say "in the japanese countryside", since I'm not sure that it is the same in Tokyo or Osaka), almost all housewifes wear an apron dress (is this the right word?) during their household work. And most of them even wear it even when they leave the house for shopping. I did not yet understand why - perhaps to show that they don't stroll around for pleasure, but for carrying out their household's duties? 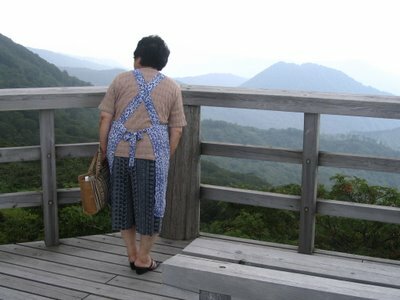 But it was really for the first time the other day that I saw a lady wearing her "uniform" even on the top of a mountain! Thank you for all your photos, I'll come back now I know your blog.